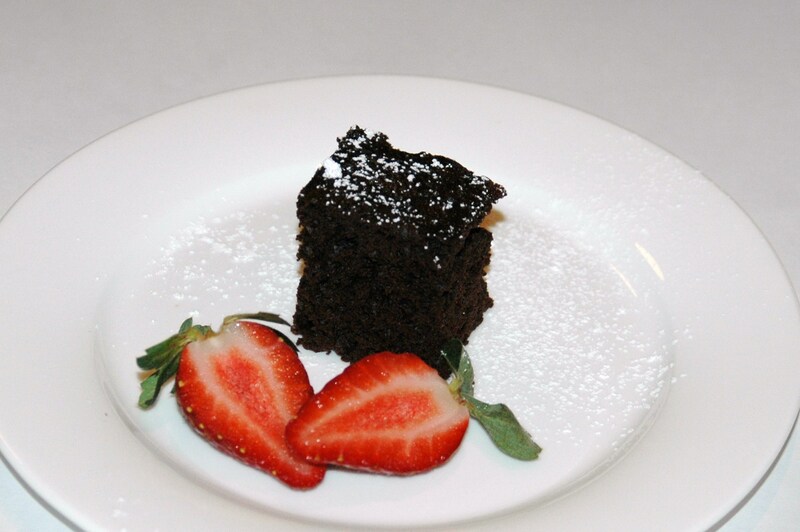 You would never guess that this brownie is low fat! 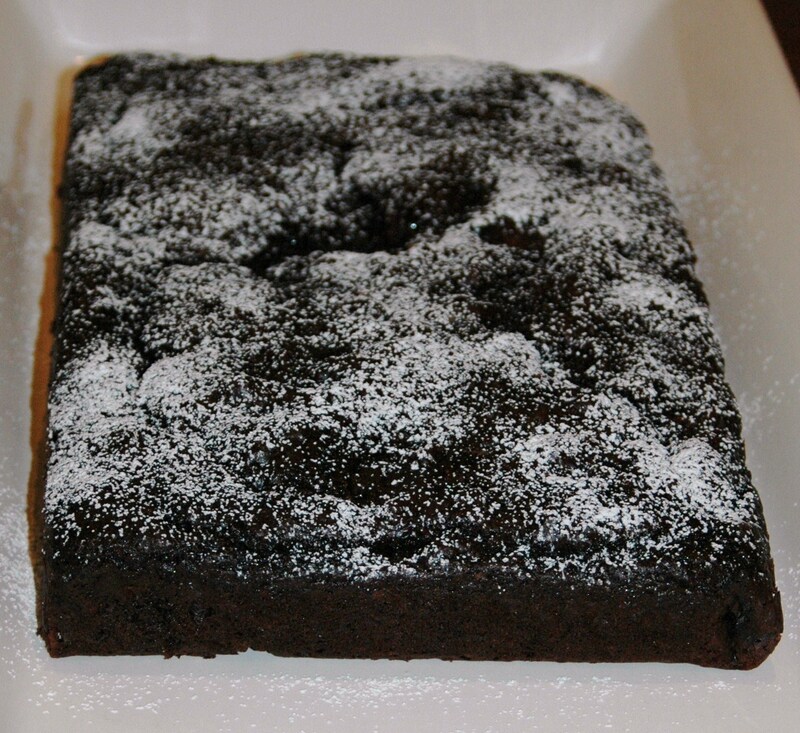 It is a seriously lusciously chocolatey, moist and delicious brownie. 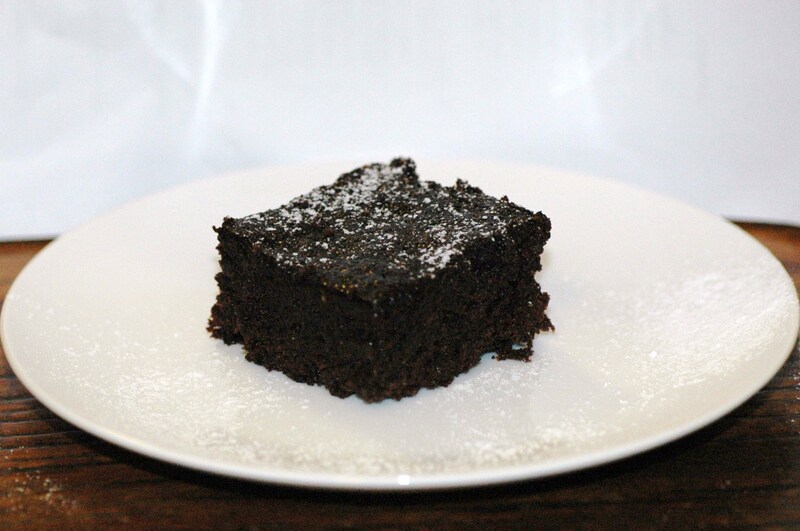 In fact when I took some to a recent function, nobody realised that it was low fat, the brownies all disappeared really quickly and I had quite a few compliments! The original recipe is from the Heart Foundation’s ‘Deliciously Healthy’ Cookbook. Of course I have changed it ever so slightly. I cut back the sugar a bit and used half wholemeal flour to increase the fibre content (and slightly lower the GI!) Using Dutch cocoa is the secret to getting the gorgeous dark color and the deliciously rich chocolatey flavour. If you can stop it from being eaten, it will keep well for up to 4 days (I haven’t managed to have any left past then to check!). I’m sure it would also be fine to freeze for a week or so. Whisk together the eggs, oil, vanilla, apple puree and yoghurt in a medium bowl. Add to the flours and fold through until well combined. Spoon the mixture into the prepared tray and bake for approx 30 minutes. 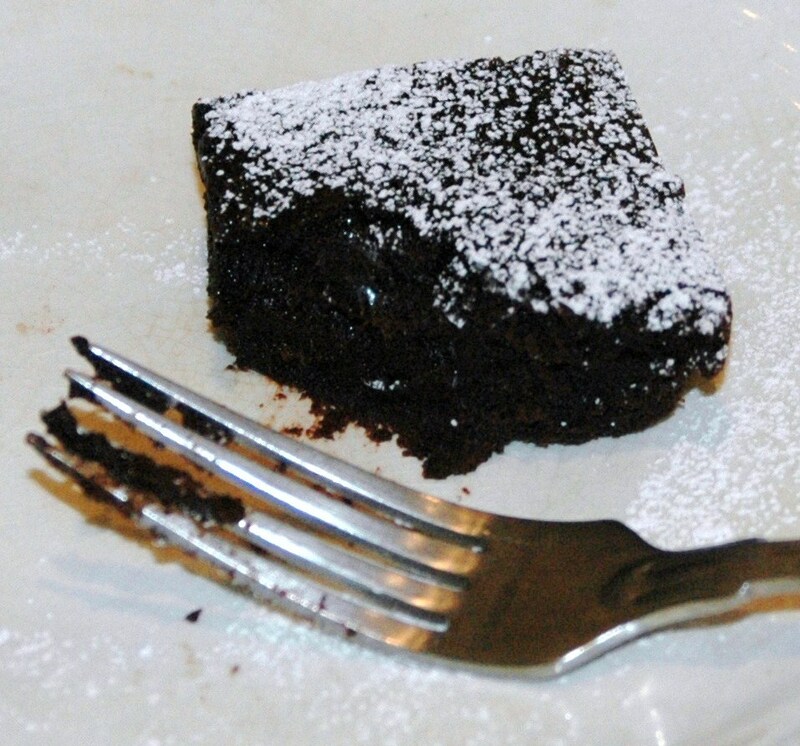 It is cooked when the brownie is firm to touch, however it may still be a little soft right in the centre. 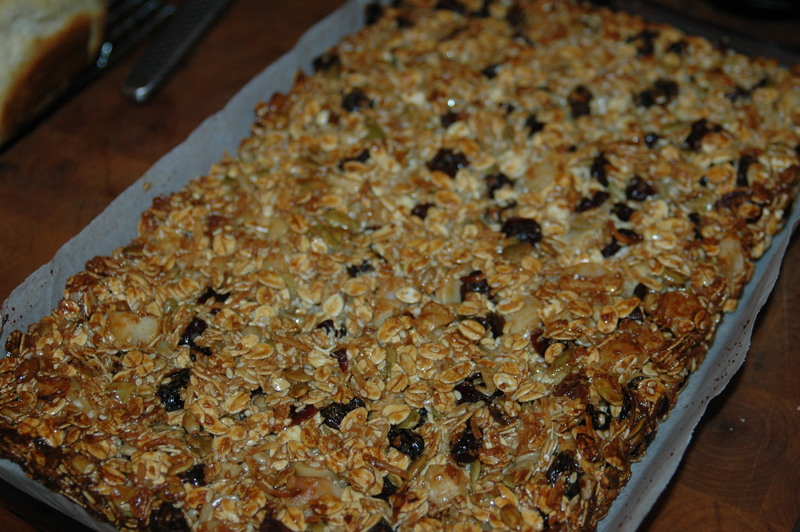 You may remember my first ever post was for my favorite muesli bars (which are still my favorite) so why would I post another muesli bar recipe? Because it is so quick and easy, even kids can make it. Besides they do taste pretty good and since we all have different tastes, you may even prefer them! A gorgeous friend of ours, Fi told me about these bars and how when making them she struggles not to eat the entire batch! That was enough encouragement for me to try them and I discovered just how easy they are. The original recipe is available here on Nigella’s website. 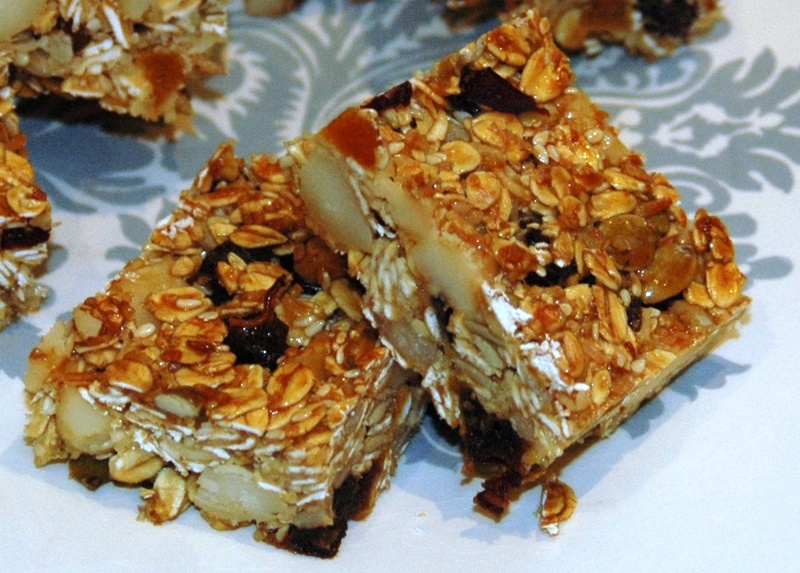 The first time I made them I changed a few things (I can’t help myself) – macadamias instead of peanuts, skim rather than full fat condensed milk and since I only had half the amount of cranberries, I substituted with sultanas. 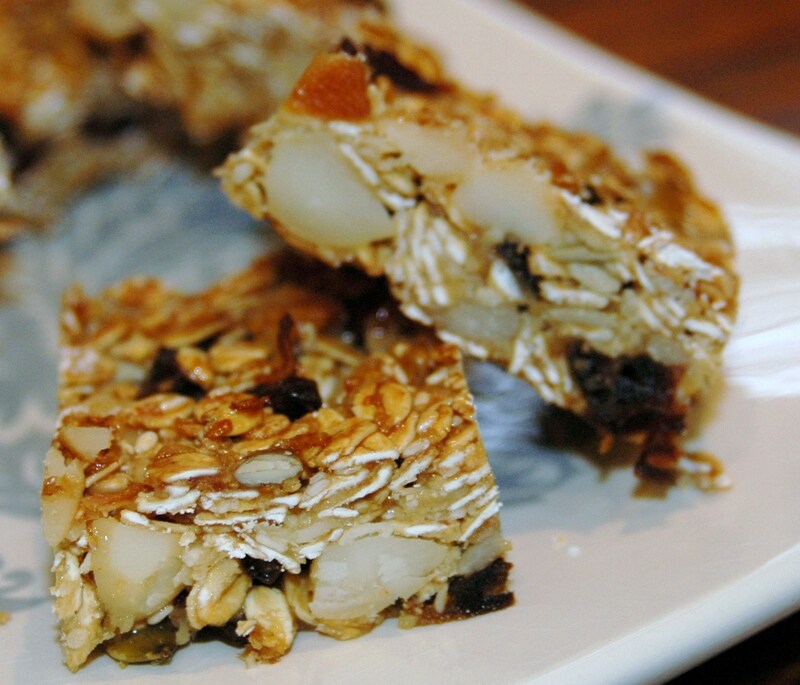 As I prefer more dried fruit in my muesli bars, the second time I made them (seriously they are so quick and easy to whip up) I added dates and apricots. Both my husband and I prefer them with this extra fruit. Why not give them a go and see what you think…even better, get your kids to make them for you – just make sure they clean up after! Preheat oven to 150 degrees. Line a 10 inch (25cm) square or similar sized rectangular tin with baking paper. Place all ingredients except condensed milk in a large bowl and mix until well combined. Pour condensed milk into a heavy based saucepan (as it is less likely to catch on the bottom) and heat over a low light until warmed through. Pour warmed condensed milk into dry ingredients and mix through until well coated. Scrape into prepared tin and press down as evenly as possible. Bake in oven for approx 50 minutes. After 30 minutes, check that it isn’t going too brown on top. If it is, cover with foil and continue baking further 20 minutes. Remove from oven and leave to cool for about 20 minutes. Remove from tin and cut into squares while still warm. Leave to cool completely. Store in an air-tight container. The original recipe was given to me by a friend and had more butter and sugar in it, which I cut back (slightly) and added prunes which help to add to the lovely, gooey texture. By cooking the cocoa with the butter and sugar, you develop the chocolate flavour so that the brownies taste like they have real chocolate in them. I use Dutch cocoa which is darker in colour and has a richer flavour than those available in regular supermarkets. I do encourage you to try making them, they are quick and easy. However I will warn you that it is hard to stop at just one! Line a 20cm square baking tin with baking paper. Combine the butter, sugar and cocoa in a small saucepan and stir over a low heat until butter melts. Cook for a further 2 minutes stirring constantly. Set aside to cool down. When cooled, add eggs one at a time, using a wooden spoon to mix in. Add prunes, then flour and mix until well combined. Spread evenly into the prepared tin. Bake for 20-25 minutes, or until just set. Allow to cool completely before cutting into 24 pieces. Each little gooey brownie has a mere 106 calories and nearly 2g of fibre! 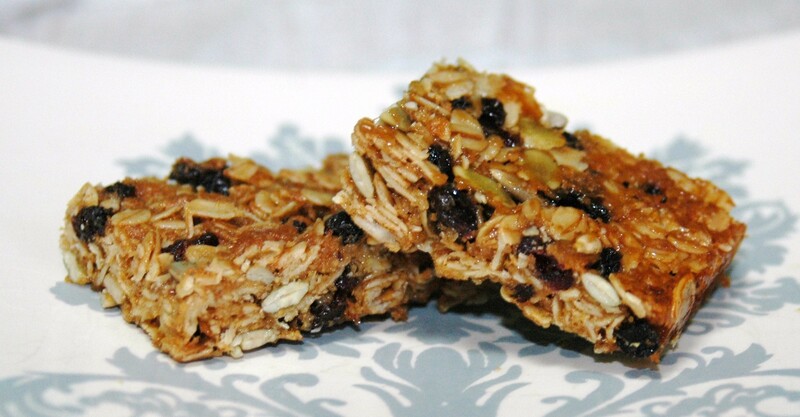 These are a much yummier alternative to those bought muesli bars with all sorts of extra “nasties” in them. 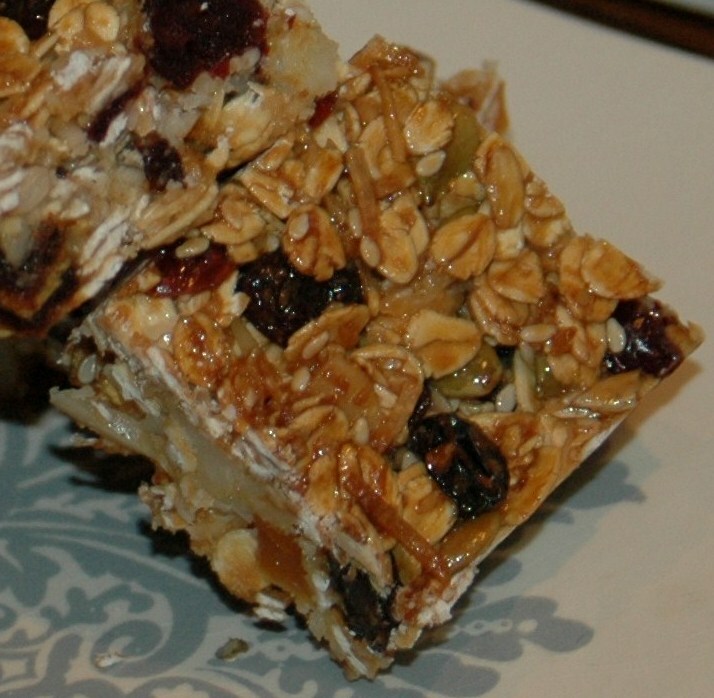 They are also more environmentally friendly too, as bought muesli bars are highly over-packaged! 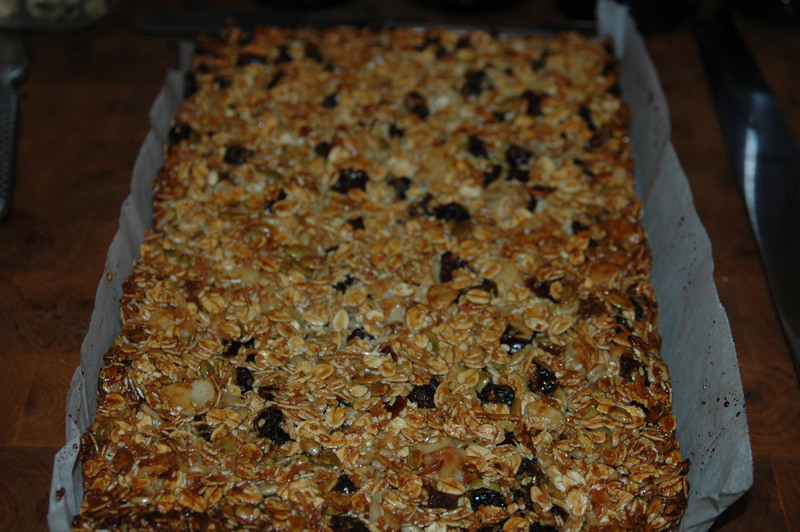 There is no flour in these muesli bars so they are also good for anyone who is wheat intolerant. 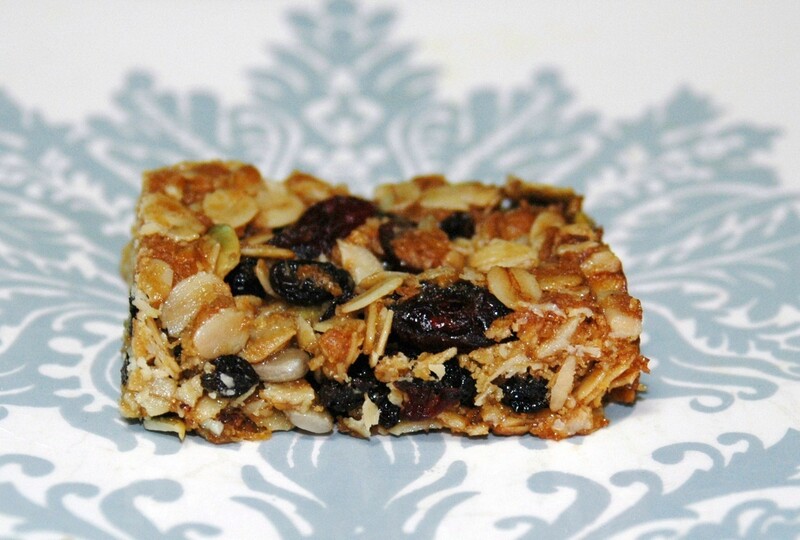 They go well as a snack in anyones lunch box (not just the kids)…if they make it that far! Preheat oven to 170 degrees. Line and grease a 20cm square baking tin. In a saucepan, heat together the oil, sugar and golden syrup. Meanwhile, mix all the dry ingredients together in a bowl. When the oil mixture forms small bubbles on the surface, remove from heat, pour into dry ingredients and mix well. Spoon the mixture into prepared tin and press down to level the surface. Bake in pre-heated oven for 18 to 20 minutes. Cool, then cut into bars before serving.